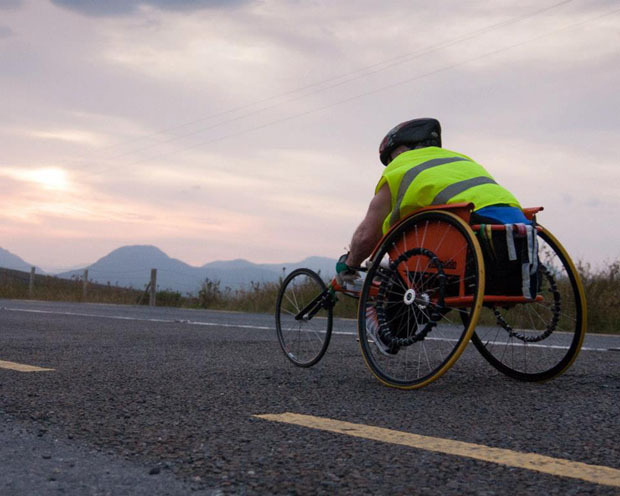 Jerry Forde has completed more marathons than any other wheelchair athlete in Ireland or the UK. My first thought every morning is the weather. It’s a bit of an addiction but I train six days a week- the one day of rest is on the advice of my doctor! The alarm is set for 7am, and I wake up to the headlines on Radio1. I have a glass of water and cranberry juice before getting my chair out of the car, then I’m off for four miles of training. My love of racing stems back to my childhood. I was born with Spina Bifida, which meant I spent most of my early years lying on my face and hands, waiting for pressure sores to heal. When I was allowed up, it was in a wheelchair that I couldn’t move myself, as the wheels were too small. Later, when I moved to another hospital, they had chairs that you could push yourself… it was great! There were a few children there as well so we used to have races down the corridors. Sometimes a worker or a nun would come through a door and SMACK! Then it was a week in bed as punishment. When I got older, I’d watch wheelchair athletes on television and wish I could do what they did. Eventually I got the chance; the Spina Bifida Association bought a racing wheelchair for me. It’ll be 20 years this October since I did my first marathon. It was in Dublin and there were about 12 other wheelchairs at that race. Last year, for my 200th in Dublin, I was one of only four. I don’t know why the number is so low, maybe people don’t want to put in the training for it. I know how tough it is, but I was never coached. There is a right way of pushing a chair but I just do it my way. The warm-up, the training and the cool-down take nearly an hour every morning. After I have a wash, it’s on to breakfast, usually porridge or some cereal, along with an egg, tea and toast. The next thing is to get ready for my radio show, which broadcasts up at Cork University Hospital. It’s called Anything Goes and includes all kinds of music and the odd interview. That starts at 12.30pm so I try to leave the house by 11am… although that doesn’t always happen. I’ve been working there since 1989 after a nurse friend of mine learnt that there was a radio station starting in the hospital. She knew I’d be interested, so she put my name down. I’m on the air until 3pm with some fruit and plenty of water to keep me oiled! The evenings are my own. Sometimes, I go out to Westend Cycles in Ballincollig. I’m friendly with the gang there and if I need a job done on my chair, they’ll do it. I often just go out for a chat. I might also bring my medals into Gerald McCarthy to get them put on a plaque for my wall. I’m on marathon number 204 now, and this weekend, it will be 205 and 206 as I have the Connemarathon Race Director Invitational Marathon and then the 39.3 mile Ultra Marathon the following day. For me, the medals have become a passport in a sense. Back in the 1970s, before I ever thought about doing marathons, I was babysitting and there was a holiday brochure on the coffee table. It was advertising a coach tour of seven capitals across Europe for £200, which I thought was fairly cheap. I was also thinking ‘If they stamp my passport in all these countries, I’d have a lovely souvenir’ but (there is always a ‘but’) because we were all EU members, we didn’t get any stamps. 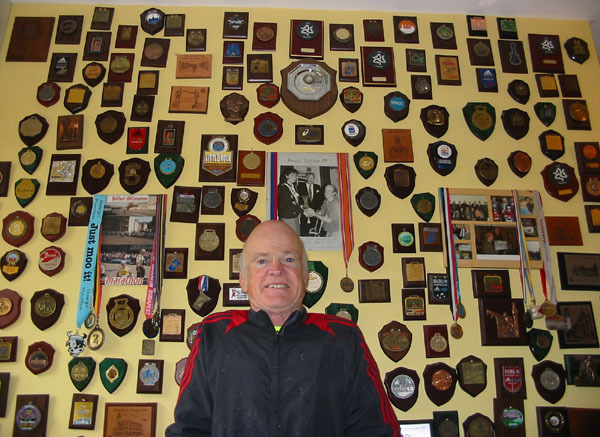 Instead I have my medals from all over Ireland, the UK, the USA, Australia and Germany. They last a lot longer! Later in the day, it’s time for dinner. Let’s just say I wouldn’t invite anyone over! I’m not into cooking but I have to get my iron up so I have red meat as much as possible or chicken, along with vegetables and potatoes. It’s usually something quite basic. I don’t go to any bother when I’m cooking for myself. Then I may go on the computer or listen to the radio. I try to get to bed before midnight, although that doesn’t always happen. Lying in bed, I often think about the next marathon. Hopefully this year I’ll do 231, so some nights I’ll be counting in my head which ones are coming up. The significance of the number is just that it’s 31 less to my next hundred. There is great craic at the races. A few weeks ago, when I was freewheeling down the hill, I said to two girls ’50 cent a lift!’. Then they were passing me going up a hill, they called back ‘50 cent a push!’ There is also one fellow down in Bandon who’ll always say ‘go on you langer’ when he is about to catch up on me, while a guy in East Cork says, ‘Jerry, I gotcha!’ I always say that I have it easier because if I’m coming down the hill, I freewheel, however, runners- from start to finish- have to put one foot in front of the other. Races have given me a new lease of life. They took me from lying in bed to having now travelled the world. The moment it all changed for me was when I was 20. I had been living in the Cheshire Home since I was 12 and one day I had a disagreement with one of the powers that be there, so I walked out. I was just out of orthopaedics after an operation on my foot, and I took an overgrown path down to the road, avoiding the main driveway in case someone saw me. Downhill, on one leg and crutches, it was a bit dicey. I knew if I fell, nobody would find me for ages. I made it to the bottom and turned for the Dunkathel Roundabout because I knew someone who ran a kindergarten in Glounthaune. The wife of the manager of the Silversprings Hotel at the time passed me and gave me a lift… little did she know what I was up to. The person who ran that kindergarten had two other people employed as well, and it was decided that I would sleep in one person’s house the first night and the other persons the next in case the gardaí were called. I was like someone on the run! I heard afterwards that it was decided not to send the gardaí because I never had anything to do with them before. They thought I would die of the shock! Eventually I went back to Clarinbridge in Galway, where I’m originally from, with my parents. It was thought that I might come back refreshed after a month at home but I wasn’t having it. Instead, I went to HELP Industries on Vicars Road, which is run by COPE and trains disabled people for employment. I then went to work for a ladies tailor and learned how to shorten dresses. That was actually quite useful because when I buy pants, they’re usually too long. After two years there, I got a job as a rep for St Martin’s Pools and later went on to hospital radio. Deciding to leave Cheshire Home that day was a huge step. Imagine being put somewhere when you are 12 years-old and realising that is where you will be staying for the rest of your days… it’s an awful kick to the system. From the word go, for 20 years, I knew nothing but institutions. I imagine I’d be a different person altogether now if I didn’t leave that day, someone who couldn’t communicate at all. Those 20 years of my life were wasted, and then there was the slow process of fitting into society. However, now I’m part of the scene, and the fact people want to write about me is quite amazing. The year before last at the Dingle marathon, a girl in her early 20s approached me and said I was the reason she started running. Then at the Dublin marathon, a researcher for the Pat Kenny on RTÉ Radio 1 told me the same girl had spoken on-air about how much of an inspiration I was to her! 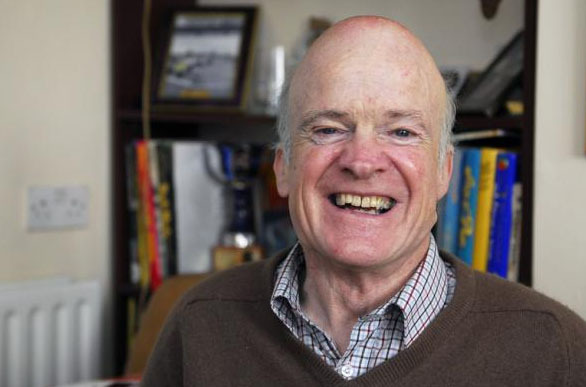 I’m also chuffed at young people- who wouldn’t know me at all- passing me in races and saying ‘you are my hero’. That really gets me. It’s amazing to be somebody’s inspiration.